It’s no secret that CEOs have been raking in millions of dollars in salaries, stock options, retirement benefits, and perks like country club memberships and private jet use at a rate that far outpaces the growth of rank-and-file workers’ wages. What’s more, even when their companies don’t perform well or when the top dog gets the boot, the CEO still gets out with a golden parachute worth millions in severance pay, retirement benefits, stock options, and other benefits. This Thursday, the House Committee on Oversight and Government Reform hosts three ousted CEOs who led their companies into the subprime lending market. Angelo Mozilo of Countrywide Financial Corp., Stanley O’Neal of Merrill Lynch & Co., Inc., and Charles Prince of Citigroup Inc. will all face tough questions about why they got out with a golden parachute while their companies’ bottom lines—and more importantly, the housing market—took a nose dive. CAP has a by the numbers look at the havoc wreaked both on the housing market and on company finances by the three CEOs. 2,203,295: Number of foreclosures reported in 2007. That’s a 75 percent increase over 2006 numbers. 12 months: Number of consecutive months of declining house prices, as of December 2007. …While CEOs of the companies that led us down this path have been let go with golden parachutes. 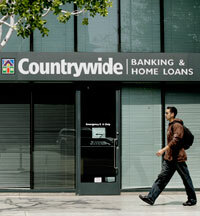 $704 million: Countrywide Financial Corp. net loss in 2007. 11,000: Number of workers Countrywide laid off between July, 2007, and January 29, 2008. $37.5 million: Approximate value of cash severance payments, consulting fees, and perquisites (including private airplane use) that Angelo Mozilo, founder and CEO of Countrywide, gave up after Countrywide’s merger with Bank of America. $23.8 million: Estimated value of Mozilo’s company retirement plan in December 2006, the last year for which data are available. Mozilo did not forgo these benefits. $161.5 million: Value of securities and retirement benefits that Stanley O’Neal walked away with from Merrill Lynch when he retired. O’Neal did not receive a traditional severance payment. $7.8 billion: Merrill Lynch net loss for all of 2007. $17.4 billion: Citigroup write-downs on subprime related direct exposures in 2007. $9.83 billion: Citigroup’s 2007 fourth-quarter loss. $40 billion: Approximate value of Prince’s retirement package, shares, and options in Citi stock upon his retirement in November, 2007.